Ice hockey isn’t the only recent addition to the desert city of Las Vegas achieving major success. Prior to the arrival of the Golden Knights, the city welcomed Uber and Lyft in 2015 and the ride-hailing companies have upended the traditional transport market. In a new study with Alexander Paz in “Transportation Research,” we look at the effects of this shift on both the taxicab industry and public transit. Has taxicab ridership decreased significantly? And by what magnitude? Do ride-hailing services have negative or positive impacts on transit ridership? What about biking and walking? Do ride-hailing services increase, decrease or have no significant effect on traffic volumes? What about overall vehicle-miles traveled? Is there an overall net reduction or increase, as a result of ride-hailing services? How does this affect emissions? 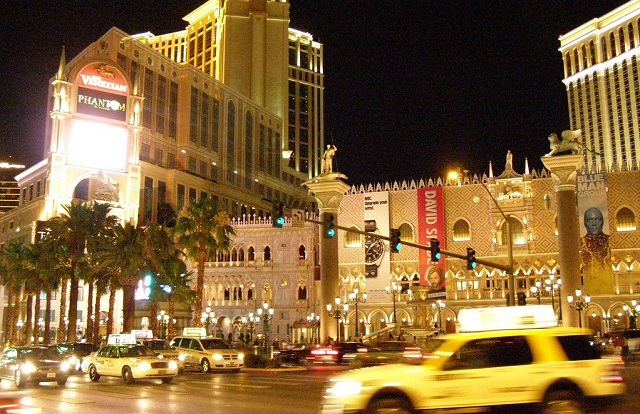 The city of Las Vegas provides a unique setting to explore the effects of ride-hailing services. With one of the fastest population growth rates in the United States and just over 2 million people already, Las Vegas also draws around 42 million international and domestic visitors each year. The effects of ride-hailing services on the large taxi industry, then, are significant for the city’s economy. In our study, we formulated a statistical linear regression analysis using a multi-modal, time-series travel dataset to estimate the effects of ride-hailing services on taxicab ridership. After controlling for several indicators, including the total number of monthly visitors, transit ridership and other socio-economic variables, the results showed that ride-hailing services do in fact have a negative, and significant, effect on taxicab ridership. 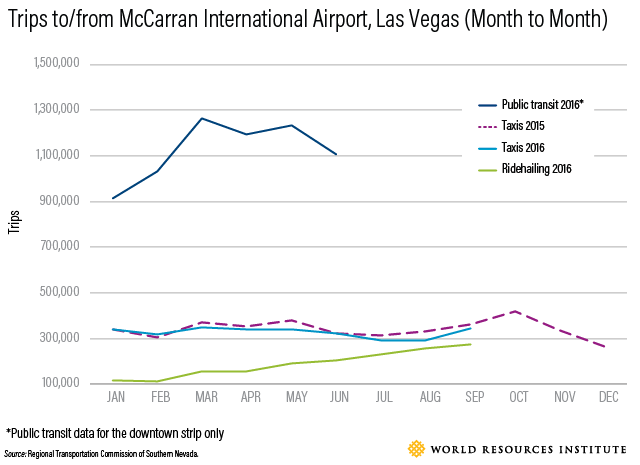 As can be seen in Figure 1, monthly taxicab ridership in Las Vegas fell by an average of 15 percent in 2016 when compared to the previous year before ride-hailing services began operation, as measured by trips to and from the airport. And in May, which tends to be one of the busiest months for taxis, ridership fell by more than 25 percent. During the same time, transit ridership saw a slight bump in ridership. A perhaps more profound and counterintuitive finding, however, was that transit ridership along the resort corridor actually complemented, rather than competed with, taxi ridership. In other words, as transit ridership increased, so did taxicab ridership. The increase is subtle, according to the model results, but it is there. If one were to then take it a step further, it’s possible that as ride-hailing directly replaces taxis, transit ridership will take on a similar complementary relationship with ride-hailing. This finding could have significant implications moving forward, as many cities are struggling to understand how ride-hailing is affecting their public transit systems. It suggests that, at least in some cases, public transit agencies should embrace and integrate, rather than compete directly with, ride-hailing services. Las Vegas currently has extensive bus lines, one bus rapid transit line, a downtown bike sharing system and plans for light rail. Using ride-hailing services to pick up individuals with disabilities, including the elderly, directly from their homes, i.e., “para-transit,” is one avenue for collaboration, for example. Entering partnerships to enable “first- and last-mile” connectivity to help commuters get to and from transit hubs – typically the most burdensome part of any commute – is another option, as the town of Summit, New Jersey, has done. Ride-hailing companies continue to upend the growing market of transportation-for-hire services in major metropolitan areas, both revolutionizing travel and redefining the concept of the taxicab experience. This should come as no surprise given its user-friendliness, including ease of payment, complete door-to-door service, minimal wait times, and comparatively low out-of-pocket costs. It would be disingenuous, however, not to mention the magnitude of controversy that has surrounded ride-hailing services since their conception, and the ongoing litigation battles between taxicab unions, state lawmakers and local city councils regarding regulatory statutes in many places. The opposition argues that ride-hailing services are no different from taxis, and they should be held to the same operating standards, including licensing, fare regulation and driver safety standards in order to maintain a fair playing field. Cities around the world are also questioning the impacts of ride-hailing companies on public transit, and whether they are significantly cutting into ridership. New York City for example has seen transit ridership go down, in part because of ride-hailing companies. But New York also has a deteriorating, unreliable, and costly subway system that has turned off many riders. The same could be said for Washington, D.C., where ongoing metro repairs and delays are ubiquitous. Las Vegas, on the other hand, is a growing city, with lots of untapped potential for public transit. It could serve as a model for how developing cities can build an integrated (and fair) transport system before their human and vehicle populations explode. Seth Contreras is an Air Quality and Road Safety Associate at WRI Ross Center for Sustainable Cities. He was a Senior Planner with the Regional Transport Council of Las Vegas in 2016. Alexander Paz is an Associate Professor in the Civil Engineering Department at the University of Nevada, Las Vegas.